AMNA/ European Day Without Cars was marked in Samos and throughout the rest of Greece on Saturday. Central city streets were closed off to cars in many urban centers, as bikers took advantage of the car-free streets and showed up in numbers. The Bicycle Association of Veteran Athletes organized a 200-kilometer non-competitive large distance race, with more than 410 bikers participating. September 22 was designated as European Day Without Cars as a self-standing day in 2000, under the auspices of the European Commission. Pedestrians, bicycles, public transit and other forms of sustainable transportation are encouraged on these days, and people are invited to reflect on what their city would look like with a lot fewer cars, and what might be needed to accomplish that. Two important works of art have been surrendered to the nation in lieu of taxes. Samian Sibyl with a Putto by Guercino (1591 – 1666), has never before seen by the public and La Ferté by Richard Parkes Bonington (1802-1828) have both been allocated to the National Gallery by the Arts Council England under the Acceptance in Lieu scheme, which allows donors to leave major works of art to the nation in lieu of inheritance tax. These two paintings make an important addition to the National Gallery’s permanent collection and are now available for visitors to enjoy in Rooms 42 and 32 respectively. This painting is directly related to the National Gallery’s Cumaean Sibyl, which was painted in 1651 by Guercino for his patron Giuseppe Locatelli of Cesena. As told by the artist’s early biographers, the Cumaean Sibyl painting was being finished when Prince Mattias de’ Medici, brother of Grand Duke Ferdinand II, sighted it and convinced Guercino to sell it to him. The artist then had to create another painting for Locatelli and, rather than repeat the same composition, he painted The Samian Sibyl so that each of his noble patrons would have an entirely original composition. It is rare to be able to display subsequent versions of compositions. Their juxtaposition offers a profound and clear demonstration of the artist’s ability to vary a basic compositional formula to create a distinctive mood. The points of distinction between the two Sibyl paintings – one being active and the other contemplative – make them function as a brilliant pair, even if this was not intended by the artist. Richard Parkes Bonington’s La Ferté – This is the first work by the great master, Parkes Bonington to enter the National Gallery’s permanent collection. La Fertéestablishes the connection between the French and English painting traditions and beautifully enhances the National Gallery’s landscape collection. Richard Parkes Bonington’s La Ferté , probably depicts the estuary of the river Somme, on the French coast of Picardy. A hamlet on the outskirts of the small port of Saint-Valéry-sur-Somme, La Ferté offered wide unspoilt views and was a favourite sketching spot for Bonington and his painting companions, Paul Huet and Thomas Shotter Boys. This open-air study painted in 1825 is likely to have been made on the spot and conveys the changeable weather of the Northern coast. Characterised by a fluid handling of paint, light , smooth horizontal sweeps of his brush evoke the sky, the brisk sea air and the sand washed tide whilst vertical strokes suggest distant rain showers further in the horizon. Foam and seaweed are picked out with a few thicker highlights, painted wet-in-wet and some details such as the large boat and the woman on the right may have been added later in Bonington’s studio. Its inclusion in the National Gallery collection will enable visitors to appreciate the freshness and freedom of Parkes Bonington’s modern brushwork and the impressionist investigations into open-air painting. Giovanni Francesco Barbieri, called Guercino (‘squinter’) (1591 – 1666), was born in Cento, near Ferrara. He became one of the leading painters of the Bolognese school and was one of the most accomplished draughtsman of the Italian Baroque. His early work shows the influence of a variety of North Italian sources, most notably the work of Ludovico Carracci and Venetian artists of the preceding century. He developed a highly individual style that shows a command of subtle effects of light and dark, strong colour, and robust brushwork. After serving the Bolognese Pope Gregory XV in Rome in 1621–3, his work began slowly to change as he came under the influence of a more classical style of painting. His figures reveal an acute command of the affetti, gestures and facial expressions that reflect the study of body language in relation to the classical tradition. In his later work, such as Samian Sibyl, he was deeply affected by the austere classicism of one of his greatest rivals, Guido Reni. Richard Parkes Bonington (25 October 1802 – 23 September 1828) Born of English parents, Richard Parkes Bonington spent much of his short life in France. He initially studied painting in Calais before moving to Paris. In 1818 he first met Eugène Delacroix and enrolled in the atelier of Baron Antoine-Jean Gros. A keen traveller, he spent much time exploring Normandy and Picardy, frequently sketching at St Valéry sur Somme and nearby La Ferté with his painting companions, such as his great friend Paul Huet (whose work is also represented in the National Gallery collection). In 1825 he visited London with several French artists, including Delacroix, and in 1826 he travelled through Switzerland to Venice. He died tragically young, at the age of 26, from consumption. The 1st Samos International Film Festival – Between Two Continents has started and there will be all kinds of amazing international film screenings on the beach. respect when meeting one, today this custom is only followed in small villages. is supposed to be very bad luck to kill a bat. off the evil eye from the property. Greece and not Friday the 13th . Based in Athens – Greece, one of the most beautiful charter destinations in the Mediterranean, the luxury charter yacht DALOLI (ex AA Absolute, Teeth, La Bella 2) is currently offering a 9 days charter special at a price of 7 days. DALOLI superyacht was built by Heesen Yachts in 1995 with two recent refits in 2007 and 2012. She is available at an excellent charter rate of € 45,500 per week plus expenses and you will get two additional days for free if booking minimum of 7 days in the month of September. Stylish accommodation is offered to 8-9 guests in four luxurious cabins. Motor Yacht DALOLI features modern interior design and styling with a 2007 refurbishment including a full interior refit as well as a full mechanical refit. In 2012 she has received an additional refit, making this vessel looking better than ever. Although her spacious salon is furnished in a ultra modern style, it is very comfortable, featuring low couches to port and starboard. One of her most striking features is the central staircase, incorporating charcoal burled wood veneer, stainless and Lucite handrails. Superyacht DALOLI provides her charter guests with elegant and comfortable accommodation layout in one master cabin, two queen bedded VIP cabins as well as one twin cabin with two single beds. The upper deck of Daloli yacht hosts a sophisticated high-tech wheelhouse with the latest in electronics. Just aft of the wheelhouse the newly decorated sky-lounge / office can be found, where two semi-circular, camel ultra soft leather sofas with accent pillows and built-in tables assure guests’ comfort at any time. One side of the sofa is convertible into a lounge-type sofa that is the ultimate spot to relax while indoors. Built into the cabinetry is a U-Line icemaker and a Sony Tv with DVD & surround sound. Accessible through full-sized glass doors is the sun deck area, which can be found aft of the sky lounge. Here we have an L-shaped settee forward to port accompanied with a hi-lo table that converts into a sunpad. There is another settee aft as well as a wet bar with sink, icemaker, refrigerator, four stools, Jenn Aire grill, and generous sunning area. Furthermore, the aft deck offers a great space for al fresco dining and relaxation thanks to a large table and a built in couch located to aft. Measuring 36 metres (120 ft) charter yacht Daloli is a very speedy vessel, able to reach up to 38 knots with a cruising speed of 25 knots. She is managed by a professional and friendly crew of 7. Situated in the Eastern Mediterranean, Greece offers its charter yacht holiday makers an amazing selection of destinations to explore. Greek Islands are renowned for their ancient history, modest yet striking architecture as well as beautiful little waterfront villages scattered around. In addition, chartering a motor yacht or a sailing yacht in Greece will give you the opportunity to discover its beautiful aqua or dark blue waters and the wonderful warm Mediterranean weather. Greek yacht charters can be divided into four major destinations, including the Ionian Islands, the Aegean and Sporades, the Cyclades and the Dodecanese. Ionian Islands offer such cruising destinations as Corfu, Kefalonia, Zakynthos, Lefkada, Ithaca, Paxi and Kythera – also known as The Seven Islands or Eptanisa. The Aegean and Sporades are perhaps one of the less visited destinations in Greece, making them the perfect place for a quieter yacht charter holiday. Art lovers and those interested in culture and history will certainly feel sattisfied around here. 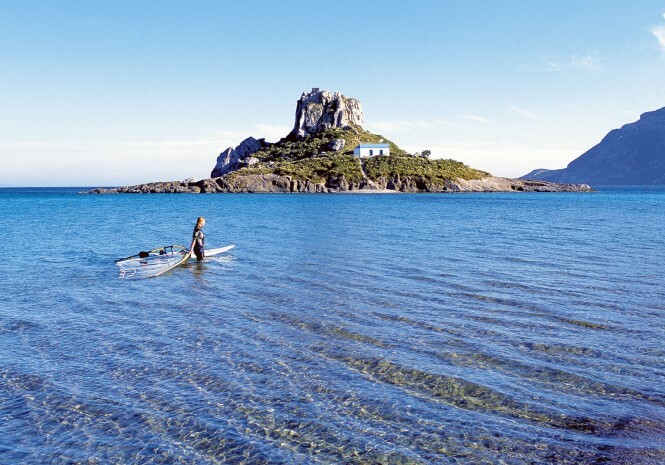 Some of the islands to explore include Samos, Lesvos and Samothraki. The Cyclades are another popular yacht charter destination offering both culture as well as natural beauty. Boasting ancient sites, Byzantine castles, museums, lively nightlife, great shopping, dining and excellent beaches, some of the Cyclades most sought after places are Mykonos, Delos, Santorini, Sikinos, Paros and Naxos as well as Serifos. The Dodecanese is the most southern group of islands in the Southern Sporades. Here you have 14 large islands to discover and cruise around, including Lipsi, Parmos, Leros, Kalymnos, Kos, Astypalea, Nisyros, Symi, Tilos, Rhodes, Khalki, Karpathos and Kasos as well as around 40 smaller islets and rocks. The view from the hills overlooking the town of Samos on Samos island. 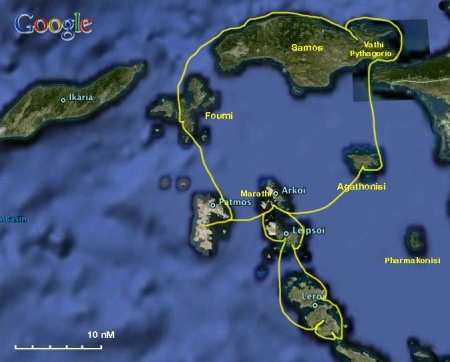 “Leaving Chios we had a fast ride (sailing) downwind all the way to Samos Island. The Meltemi, the prevailing northerly summer wind was blowing about 15-20 knots, so our 70 nm trip flew by reasonably quickly. Samos is a large, very steep mountainous island much of it covered in Olive groves. We arrived at our first anchorage Posedonian and spent two quiet days here. It is an anchorage surrounded by a small fishing village, a popular spot at the height if summer with charter yachts that came from the main town just around the corner. We then headed for Pythagoria a major town on the island with a beautiful harbour, where we were able to tie up to the wall right in front of the town centre. Pythagoria is the birthplace of Pythagorus the Greek mathematician famous for the Pythagorean theorem. There is a statue at the entrance to the harbour honoring him. There was much to see in the town and surrounds, with an excellent archaeological museu m, an underground water tunnel and monastery perched on a hilltop. 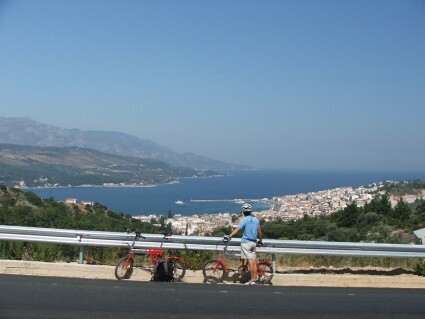 It was a great island to sightsee by bike and one day we rode over a steep mountain range to the capital Samos Town where we explored another excellent archaeological museum. The history of Samos dates back to 8th century BC amd must be a delight for archaeologists, as many artefacts have been disovered on the island, documented and now displayed in the museums and provide an excellent story of the civilisation of Samos. Sportif have put together new multi activity and windsurf coaching weeks to the wonderful Greek Island of Samos in the North Aegean. These fun and sociable weeks include windsurf coaching, mountain biking and a host of activities led by successful British Coach Rob Horne. Rob has enjoyed a reputation built up over many years in Dahab as a highly effective windsurfing coach. Based in Samos from June to October, he successfully teaches windsurfing to all levels from teenagers and beginners first starting out to expert level slalom and freestyle technique including looping. With the variety of conditions and top quality Fanatic and North equipment available from the first class windsurf and bike centre you can be sure to improve and have fun at the same time. Tourist agents appear optimistic as the data regarding the tourist reservations for the first six months of the year are showing better than expected results, with 6,336,370 visitors recorded. Greek airlines released a report showing that losses compared to the same time period last year were only 3.77%, while a much larger decline was expected. Strife-ridden Athens has been strongly hit, however, with 240,000 fewer tourists compared to last year’s same months. The Halkidiki peninsula and Ionian islands such as Corfu and Kefalonia, on the contrary, showed strong results in attracting tourists. The Northern city of Thessaloniki, the country’s second-largest, is also doing better than expected during an economic crisis. On Aug. 9, the Aida cruise ship arrived in port along with 1,413 tourists, most of whom were Germans, a country which has been feuding with Greece over austerity demands being pushed by international lenders and supported by Berlin. A number of excursions has been planned to Halkidiki, Dion and Vergina, while other tourists will explore the city with bike tours. The cruise ship will also stop by at Samos island and is expected to return to Thessaloniki next year. The Aida will spend five nights on Thessaloniki port during 2013! In a bid to attract more tourists, the Greek state has made the visa granting process much easier and less expensive in the past few months. According to Ministry of Foreign Affairs of Ukraine, Ukrainian tourists are now allowed to visit five Greek islands (Samos included) without being provided with Schengen visas by September 8. Ukrainian News website reported that Ukrainians will have the chance to leave some Turkish harbors and stay on Greek Chios, Kos, Lesvos, Rhodes and Samos islands for 15 days. The tourists will have to buy their tickets for the ferry or book a hotel on the islands by contacting to any travel agency. Within a day, they must submit a copy of their passports, a photo and a completed visa application form at the travel agencies. Then, the tour agents will send them via email to the Hellenic Immigration Service. 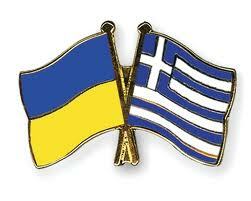 The visa fee that Ukranians will be asked to pay upon their arrival on the Greek islands is 35 euros.